Introduces the WildTrig series, inviting you to learn a new approach to geometry and trigonometry. This series will give a careful introduction to rational trigonometry and universal geometry---valid over a general field. The series is based on my book Divine Proportions: Rational Trigonometry to Unviersal Geometry which is available at wildegg.com, where you can find many more resources to understand and work with this powerful new paradigm. Metrical geometry in the plane as well as in higher dimensions is transformed by this theory, as are elliptic and hyperbolic geometries. The usual trigonometry is overly complicated, inaccurate and logically dubious. This is the first of a series that shows you a better way---rational trigonometry! Rational trigonometry replaces distance and angle with more algebraic notions called quadrance and spread. All of those complicated formulas become much simpler, you don't need a calculator any more, and the theory extends Euclidean geometry to arbitrary fields! What mathematics teacher or student could ask for more? Assoc. Prof. N J Wildberger from UNSW is also the creator of the MathFoundations series, the WildLinAlg series, and a more advanced video series on Algebraic Topology. Enjoy! We show how the basic notion of rational trigonometry---quadrance---arises from the geometry of the ancient Greeks. The little-known sister theorem to Pythagoras features prominently, and is closely related to a theorem of Archimedes. For someone brought up on classical trigonometry, quadrance is the square of the distance. But future generations will come around to the Euclidean realization that it is quadrance which is actually the fundamental quantity: distance is the square root of quadrance--assuming (and it is a BIG assumption) that you have a viable theory of square roots around. Pythagoras' theorem is matched up with the Triple quad formula (TQF) ---in my opinion these are the two most important theorems in mathematics. The reach of the TQF is long indeed. Angles have their origin in astronomy and spherical trigonometry. Here we introduce the rational alternative, called spread, and give examples from ISO paper sizes to the faces of a dodecahedron. ​The spread between two lines varies from 0 to 1, and is a non-linear scale. Its advantages are many, including that we can calculate it precisely for any two lines, and that the circular functions are not needed when we work with spreads. We derive from first principles the main laws of rational trigonometry, using the concepts of quadrance and spread to replace the usual distance and angle. Most everything works out much simpler. These are among the most important laws in all of mathematics. Rational trigonometry is applied to solve four examples of practical problems, concerning a flagpole, a ladder, a kite and the distance from a point to a line. Heron's formula, originally due to Archimedes, is here recast in a simpler and more natural form. And we prove it, using one of the basic laws of rational trigonometry. Shows how to solve triangles using the framework of rational trigonometry with quadrances and spreads replacing distance and angle. We study the circumcenter, orthocenter and centroid of a triangle using rational trigonometry. Using rational trigonometry we develop Menelaus' and Ceva's theorem and some related results, namely the Law of Proportions, and the Alternating spreads theorem. We derive some of the most fundamental facts about a circle using rational trigonometry---the Subtended spread theorems and the Equal products theorem. Rational trigonometry can be used to solve surveying problems, usually more simply than the current way. This video gives three examples: finding the height of a mountain, Regiomontanus' problem, and spreads over a right triangle. Cartesian coordinates allow us to talk precisely about points and lines, parallel and perpendicular, and quadrance and spread---the two main concepts from rational trigonometry. This video reconciles two different definitions of the spread between two lines. It also shows why spreads are generally superior to angles in a Cartesian framework. The usual unit circle is best described by rational parameters, not transcendental ones. This approach is much older, and connects with Pythagorean triples, along with rational trigonometry. Complex numbers are here explained using geometry and their intimate connection with dilations and rotations. Pure rotations are related to the parametrization of the unit circle. This is a quiz on Rational Trigonometry, with seven interesting and challenging questions. You can also try to solve them using classical trigonometry---but remember: only correct answers are allowed. Five problems involving a triangle, a surveying problem, a kite, a piece of paper and a cyclic quadrilateral are solved using rational trigonometry. We discuss inversion in a circle, and medians, altitudes and vertex bisectors of a triangle. These are solutions to the final two questions of Quiz 1 in WildTrig16. An introduction to finite fields, based on first understanding rational numbers. This will be the basis of extending geometry and trigonometry to the finite setting. This video explains more about arithmetic in a finite field, shows how to visualize points in a finite plane, and how to compute quadrance and spread. Examples are taken from the field with seven elements. This video discusses lines in Euclidean geometry over finite fields, and shows why the Spread and Cross laws hold. The circumcenter and circumcircle of an example triangle are found over F_7. The Euler line, the nine-point circle, incenters and isogonal conjugation. Equilateral triangles, Napoleon's theorem and Morley's theorem are discussed from the view of rational trigonometry. We give an example over a finite field with 11 elements. Spread polynomials are the rational trigonometry equivalent of Chebyshev polynomials. This video shows what they look like, how to compute them and how they link to geometry. How to cut a train track up a hill, how to compare two vertical spreads, how to measure a height from three vertical spread measurements. Stewart's theorem relates measurements on a triangle to an additional line through a vertex. Here we present the rational version, give a simple proof, some examples and an application. WILD TRIG ​28: What size ladder fits around a corner? The famous ladder problem, here solved using rational trigonometry. 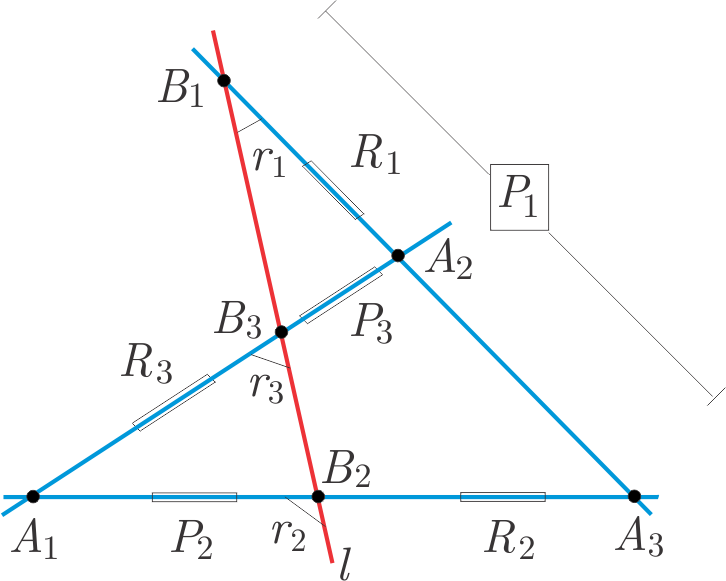 Trisecting angles from a rational trigonometry point of view, featuring a new theorem of Hadley, and relations to the trisectrix. After a review of the usual polar coordinates, we introduce the rational version, and illustrate via an ellipse, a lemniscate and the trisectrix. This video is part of the WildTrig series, which introduces Rational Trigonometry and applies it to many different aspects of geometry. A first look at Projective Geometry, starting with Pappus' theorem, Desargues theorem and a fundamental relation between quadrangles and quadrilaterals. Projective geometry has close links to artist's attempts to render accurately three dimensional objects in two dimensions. We introduce three basic rules for such perspectivities, concerning images of lines, images of parallel lines, and images of conic sections. One of the most important mathematical advances occurred in the 1800's with the introduction of homogeneous coordinates to describe the true nature of the projective plane. How to think about both projective points and projective lines via lines and planes in 3D geometry. Also we discuss some basic facts about 3D geometry, relating perpendicularity and quadrances. Affine geometry is the geometry of parallel lines. Using parallelism, we show how to construct a ruled line, how to find the midpoint of a segment, and divide a segment into a given ratio. We connect this to Archimedes law of the lever, and then extend to barycentric coordinates with respect to a triangle. Using vectors, we define parallelograms, discuss affine combinations, and show how to derive barycentric coordinates without any notion of weights. The cross ratio is the most important invariant in projective geometry, and plays a key role in hyperbolic geometry. We introduce it here using vectors, that is in the framework of affine geometry. We extend the cross ratio from four collinear points to four concurrent lines, and introduce the special cases of harmonic ranges and harmonic pencils. Four points on a line with a cross ratio of -1 form a harmonic range. Four lines through a point with a cross ratio of -1 form a harmonic pencil. These two notions are intimately linked, and related naturally to quadrangles and quadrilaterals. The fundamental theorem of projective geometry states that any four planar non-collinear points (a quadrangle) can be sent to any quadrangle via a projectivity, that is a sequence of perspectivities. We prove this by first establishing the simpler one-dimensional case of three points on a projective line. Conics, such as circles, ellipses, hyperbolas and parabolas, can be defined purely within projective geometry, as realized by the nineteenth century German mathematician Steiner. This is done by using projectivities. There are essentially two dual constructions, one giving a line conic, the other a point conic. We illustrate using The Geometer's Sketchpad, a useful software program for students of geometry. Rational trigonometry can be developed purely algebraically, without any pictures. This video reminds you of the basic concepts of quadrance and spread and their definitions in terms of coordinates. The most powerful law in geometry is the Cross law, the rational analog of the Cosine law. It includes as special cases Pythagoras' theorem and the Triple quad formula. Here we sketch a purely algebraic derivation of the Cross law, and then how the other four main laws of rational trigonometry follow from it. Einstein's special theory of relativity (1905) was recast by Minkowski in terms of the geometry of a four dimensional spacetime. This video gives an introduction to this idea, motivating our study of two dimensional relativistic (red) geometry. Red geometry is a two dimensional relativistic geometry in the spirit of rational trigonometry, using variants of the usual quadrance and spread. The usual grid plane is still the arena in which this geometry lives, but the notion of perpendicularity is new. A wonderful new world of geometry emerges from just a twist of the old definitions! We give some examples of calculating quadrances and spreads in red geometry, and illustrating some of the usual laws of rational trigonometry. The concurrence of the red circumcenter, centroid and orthocenter on the `red Euler line' is shown in a special case. Remarkably, the main laws of trigonometry in the relativistic (red) setting are exactly the same as those in the Euclidean setting. To establish this, we show first that the Cross law---the most powerful law---holds in red geometry. Then the others, such as Pythagoras, the Triple quad formula, the Spread law and the Triple spread formula, follow much as they do in ordinary (blue) geometry. A circle in red geometry looks like a rectangular hyperbola with asymptotes parallel to the lines of slope one and minus one. But in the red setting, such a `red' circle still satisfies many of the properties that we are used to for a circle. So this video shares some of the theorems of WildTrig 10, but in a completely different context. There is a second form of planar relativistic geometry, here called green geometry, which plays a similar role to red geometry and is closely related to it. This video introduces this geometry via quadrance and perpendicularity. We show that the laws of trigonometry in the relativistic green setting are exactly the same as for Euclidean geometry, and the same as for the red relativistic geometry. We also draw some pictures of `green circles', which are rectangular hyperbolas with asymptotes the coordinate axes, and give as an exercise the Equal products theorem. A Pythagorean triple consists of three natural numbers x, and z satisfying x^2+y^2=z^2 . By Pythagoras' theorem, this means these three numbers are the sides of a right triangle. Euclid knew how to solve this equation, and the solution involves three expressions which form also the basis of chromogeometry. Chromogeometry is a new three-fold symmetry in planar geometry, that brings together the usual Euclidean geometry (here called `blue') with two relativistic geometries (called `red' and `green'). There are two basic principles: that the three geometries are essentially alike, and that they all fit together to form a harmonious whole. Chromogeometry allows many features of Euclidean geometry to be widely generalized and enriched. Here we look at the classical Euler line of a triangle, passing through the orthocenter, centroid and circumcenter also from two relativistic geometries. Then we combine all three pictures to produce the remarkable Omega triangle. Chromogeometry allows us to study not just one, but three Euler lines of a triangle. One for each of the three fundamental planar geometries: Euclidean (blue) and the two relativistic geometries called red and green. These Euler lines turn out to be nothing but the medians of the triangle of orthocenters of the original triangle, called the Omega triangle. Many interesting features arise relating orthocenters, circumcenters and nine-point centers of different colours. Chromogeometry allows us to consider not just the usual nine-point circle of a triangle, but also a red and a green nine-point circle, which are in fact rectangular hyperbolas. This video uses The Geometer's Sketchpad to illustrate the various special points to be found on these nin-point circles, and how they interact. This video outlines how we approach proofs in chromogeometry. The emphasis is on algebraic relations and polynomial identities. A convenient shorthand notation for anti-symmetric polynomials is introduced, and formulas for the orthocenters and circumceneters of a given triangle, in all three coloured geometries---blue, red and green --- are given. The three spreads of a triangle satisfy the Triple spread formula, and given two such spreads this gives a quadratic equation for the third. The Triangle spread rules give information about which of the two solutions of this quadratic equation to take in particular circumstances. The notion of sector is introduced, along with notions of acute and obtuse. We look at a quadrilateral problem using rational trigonometry and the Triangle spread rules. The triangle spread rules allow us to determine which of two solutions of the Cross law or Triple spread formula is appropriate in many situations. We define acute and obtuse triangles, and give inequalities for acuteness in terms of the spreads of the triangle. Then we look at the circumcenter of the triangle, and express it as an affine combination of the vertices. The Triangle spread rules play a role. This video gives proofs of the two Triangle spread rules, which tell us how to choose the third spread of a triangle given two spreads. The arguments are somewhat complicated, involving some rather magical identities. One problem is on vertex bisectors and medians of a particular 6-7-8 triangle, another on squares built inside a pentagon, another on trisecting a right triangle, and the fourth on a flexible quadrilateral. These problems should be a fun challenge. Warning: they are not easy! We give hints for the four problems of Quiz #2, one concerning the 6-7-8 triangle, another about squares inscribed in the sides of a pentagon, another on trisecting a right triangle, and the last---a harder problem--on finding the diagonals of a quadrilateral given the sides and the angle/spread made by the diagonals. We look at a problem involving a triangle with side lengths 6,7 and 8. We need to find a distance from one vertex to the meet of a median and a vertex (or angle) bisector. In this video we give a solution involving straigthforward triangle by triangle analysis using rational trigonometry. Here we present another solution to the 6-7-8 triangle problem, this time using barycentric coorindates. This gives us a chance to apply the idea of assigning weights to the vertices of a triangle to determine various ratios formed by lines from the vertices meeting at a point. We use rational trigonometry to solve a problem concerning a pentagon with inscribed touching squares---the question being to find the ratio of the sides of the pentagon to the squares, and also the ratios of two circles, one circumscribing the pentagon, the other inscribed in the squares. The Golden spreads of WildTrig 25 play a key role, as they do for many problems with five fold symmetry. We analyse the third problem from our Quiz #2 (WildTrig 62). This problem studies a right triangle which has one vertex trisected, and for which we know two of the three lengths into which the opposite side has been divided. We are asked to find the length of the third segment. The second and third spread polynomials figure prominently in the solution. Euler found the volume of a tetrahedron in terms of the six quadrances of its sides. When the four points lie instead in a plane, the volume is zero, so Euler's formula gives a relation between the six quadrances. We work towards discovering this relation by studying a particular quadrilateral in the plane, and using rational trigonometry to determine the sixth quadrance from the other five. WILD TRIG ​69: What is geometry really about? We will also have a look at a lovely result for four collinear points, generalizing the Triple quad formula, and related to Brahmagupta's area formula for cyclic quadrilaterals. ​In this video we introduce the projective version of the Quadruple quad formula, which not only controls the relationship between four projective points, but has a surprising connection with the geometry of the cyclic quadrilateral. We introduce the determinant of a square matrix, giving explicit formulas for the 1,2,3 and 4 dim cases. The general pattern is also described. Then we give two important examples, one relating to the Triple quad formula and Archimedes' function, and the other to Euler's function, involved in Euler's Four point relation. The determinant of a (square) matrix is the most important function in mathematics, appearing in almost every aspect of the subject. Here we look at basic properties of the determinant, illustrated with 2x2 and 3x3 examples. In particular we relate the most important property with matrix multiplication, which is explained.